Park Sung-hyun overcame a 26-point deficit. South Korea needed a perfect shot. Park Sung-hyun didn't disappoint. 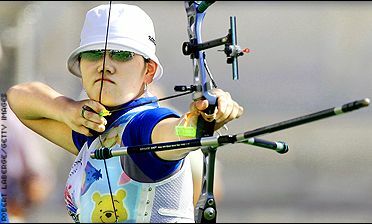 And with an individual gold behind her, Park's 10 on her final arrow gave South Korea its fifth straight gold. The men followed suit with their own gold Saturday. Those who stayed away from the men's archery event on Monday -- and there were many -- missed a banner day for Bhutan. A lifelong bow hunter, John Magera surprised everyone -- including himself -- by making U.S. archery team.